In the e-commerce world, your business’ prosperity is directly linked to the efficiency of your fulfillment center and your clients' satisfaction with their order experience. Partnering with a fulfillment company that runs an efficient warehouse and has processes and procedures in place to get your orders out correct and in a timely fashion is essential to growing your e-commerce business. One of the best ways to optimize efficiency in the warehouse is to address internal problems by adopting a Lean 6 warehousing approach. As the leading order fulfillment services provider for over 120 companies, we understand that an organized distribution center leads to greater accuracy and quicker turn times which ensures a better experience for your customers. By following the Lean 6 safety checklist, fulfillment companies can take proactive steps to ensure that their warehouse staff is prepared and able to dispatch orders correctly and efficiently. Below is a look at lean warehousing and the six-step process that can help your business thrive. The primary goal of lean warehousing is to optimize customer satisfaction and revenue by eliminating procedures that are not required. In a nutshell, every procedure that your fulfillment center implements should benefit their client's customer. Any procedure that is not beneficial to customers is viewed as wasteful and should be eliminated. What is the Lean 6 Safety Checklist? 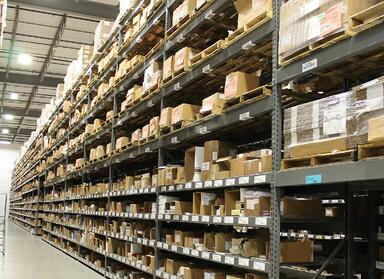 1) Sorting: Many 3PL warehouses contain a wide variety of inventory for multiple clients. For instance, a distribution center may include items for over 50 clients with each client’s inventory falling into different categories such as types of items, chronology of order cycle and/or most and least ordered products. Fulfillment warehouse staff should create different physical locations for inventory based on these categories so that all employees may easily distinguish between client inventory and the different product categories within that client's inventory. 2) Set in Order: Most warehouses contain commonly sold products or those that are ordered more frequently than others. These products should be placed in locations that are easy for distribution center staff to reach to ensure prompt order preparation. Items that are sold less frequently should be placed in less convenient locations such as toward the rear of warehouse shelves to give priority to faster selling inventory. 3) Shine: Cleanliness is critical to a well-functioning warehouse. The fulfillment center should be cleaned on a regular basis to remove dirt and debris. This measure promotes a healthy work environment and also helps to ensure that products are protected from dirt and debris. Regular safety checks should also be part of the housekeeping checklist. Entrusting your product to a fulfillment partner can cause stress and worry, however knowing that your 3PL will keep your product safe, clean and organized will provide peace of mind. The fulfillment company your business partners with should keep aisles clear and clean with no inventory left on the floor to prevent damage to the product and decrease the possibility of inventory going missing. 4) Standardize: Consistency is critical when it comes to maintaining a warehouse. This is especially important for fulfillment companies with multiple warehouse locations and/or serving multiple clients. For example, having a standard labeling process that provides all the information needed to identify product correctly will help increase efficiency. Choosing team members who align with the culture and values of the organization is also part of the standardization process. Staffing based on company values results in an improved working environment and more consistent, high quality results. Another part of the standardization process is employees having a clear understanding of job responsibilities and expectations. 5) Sustain: Successfully accomplishing steps 1 through 4 is meaningless unless your fulfillment center continually monitors and evaluates the steps they have put into place. Your order fulfillment provider must ensure that employees are following the guidelines they have established. Lean warehousing means continuous improvement. Your 3PL partner should be analyzing and assessing the processes in place regularly. If a process is not working it should be reevaluated to identify the root cause of barriers to success. 6) Safety: Each of the steps above should reflect your 3PL provider's emphasis on safety and quality control. Every time you implement a new process or procedure, you should identify potential hazards and develop steps to prevent their occurrence. Safety initiatives should be a top priority as each of the above steps is followed. For more information on warehouse safety, check out our blog Warehouse Safety Tips. How Can a Lean 6 Approach Help Your Business Prosper? The six steps above can produce powerful results for your company if they are properly followed. By choosing a fulfillment services provider with an organized warehouse environment, your business will benefit from optimized productivity and ensure that your customer’s orders are dispatched as quickly as possible. Additionally, your fulfillment center can maximize space and reduce clutter within the warehouse leading to better service. Please contact us to learn more about the benefits of lean thinking in the warehouse. We look forward to hearing from you!